Born in Belarus (Starie Gromiki village). Studied at the Economic University in Minsk, after that – on different positions in scientific institutions. On diplomatic service since 1938. 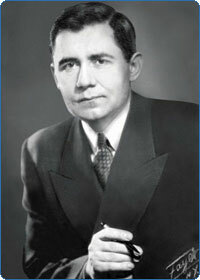 1943 - 1946 – Ambassador of the USSR to the USA; simultaneously USSR charge d’affairs in Cuba. Took part in Yalta Conference (1945), Potsdam Conference (1945). Head of delegation at San Francisco (where UN Charter was signed). 1946 - 1948 – permanent representative of the USSR to UN, Deputy Minister of Foreign Affairs (Soviet Union). Head of Soviet diplomacy for 28 years (a unique case for the Soviet Union and Russia). In March 1985 at Politburo meeting in Moscow nominated Mikhail Gorbachev for the post of the Communist Party Secretary General. 1985 - 1988 – Chairman of the supreme Council of the Soviet Union (Head of State). According to memoirs, western partners called him «Mister Nyet» for his style of diplomatic negotiations. Mr.Gromiko answer was: «I heard their «No» much often than they’ve heard my «Nyet». His motto was: «10 years of talks are better than 1 day of war».